We could hardly wait to start using the train to see the country! 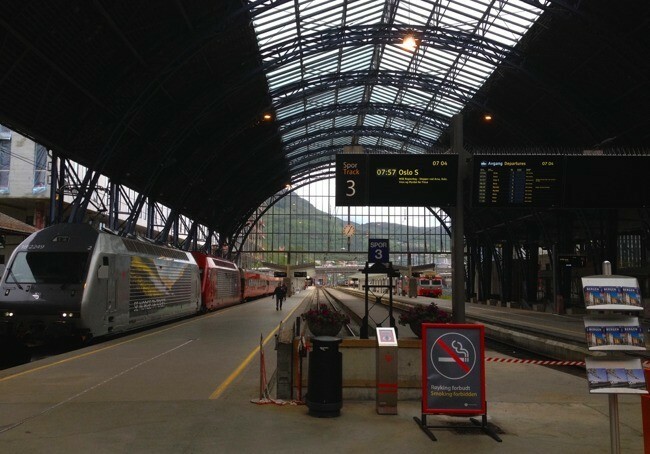 Our first trip using our Eurail passes started in Bergen, Norway. 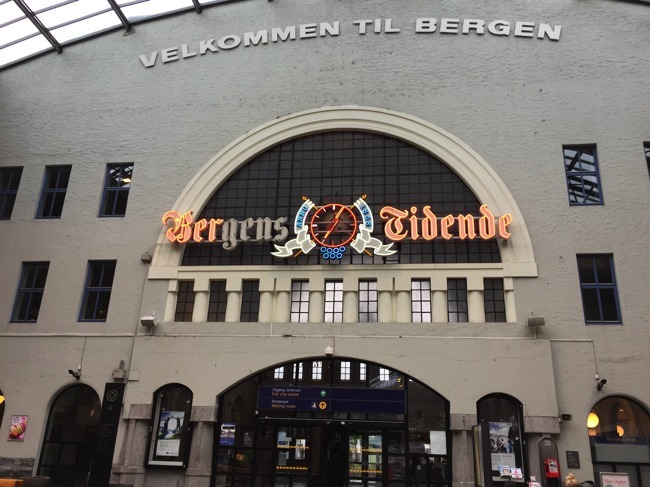 The NSB (Norwegian State Railways) train route from Bergen to Norway, also called the Scenic Bergen Railway, is a delightfully gorgeous route crossing Norway from west to east in just under 7 hours. Considered one of the world’s most scenic railway journeys, this was a much anticipated crossing of Norway. Little did we know what an incredible journey awaited us – a full white-out of snow, in June! Even though it was a very early morning start for us, shortly after we leave the Bergen station on the Bergen to Oslo train, we come across stunningly beautiful fjords, snowy mountains, and rushing rivers. The route is jaw-dropping from the very start! The train itself is very comfortable, clean, and has many modern facilities. Plenty of room to move around and free Wi-Fi that worked for a most of our trip helps you keep connected – if you can draw your eyes away from the beautiful surroundings! 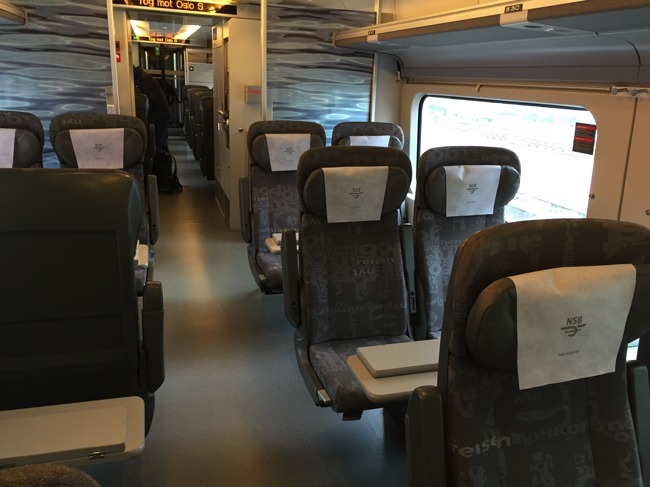 On the Bergen to Oslo train there are several seating options to fit many styles and budgets. 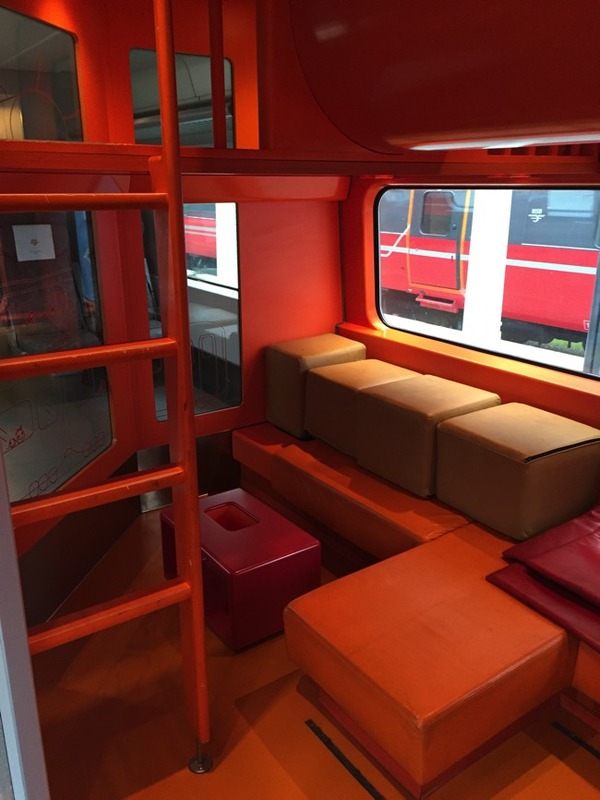 NSB Komfort Class – is included with a Eurail 1st class ticket. If you are buying an individual ticket the cost to upgrade to a Komfort seat is 100 NOK (at this writing approximately $ 14 USD). These NSB Komfort Class Seats are slightly larger and wider than NSB Standard Class seats. Hard at work while enjoying the ride! At each NSB Komfort Class seat there are tables and electric/USB hubs making it easy to catch up with some work, watch a movie on your laptop, or just to spread out a little. 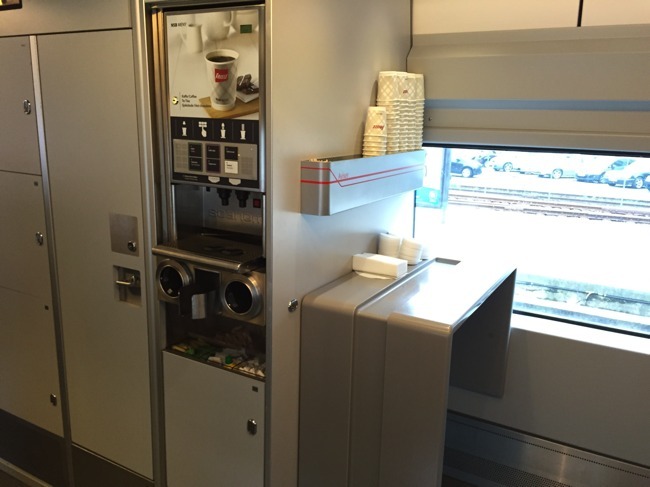 Free coffee and tea beverages are available at a self-serve station located in the middle of the car. 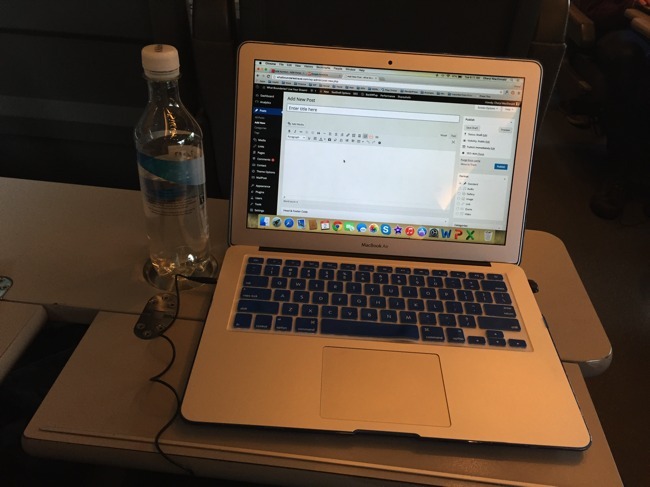 For a little more room to spread out, your own workspace, and amenities like free newspapers, coffee, and tea – we felt the NSB Komfort Class upgrade was well worth the money. NSB Familie Class – An entire car devoted to traveling families! The family car has quite a few amenities to keep little ones entertained during the trip. There are children’s books, films, and a separate playroom all designed to keep children busy. Fold down changing tables in the restrooms and an area to heat food and bottles makes it easy for parents to travel with even the youngest of passengers. NSB Standard Class – are very comfortable seats with a footrest at each one so you can stretch out. Even though these seats may be considered 2nd class, they provide much more space and legroom than airplanes are definitely a comfortable and affordable option. 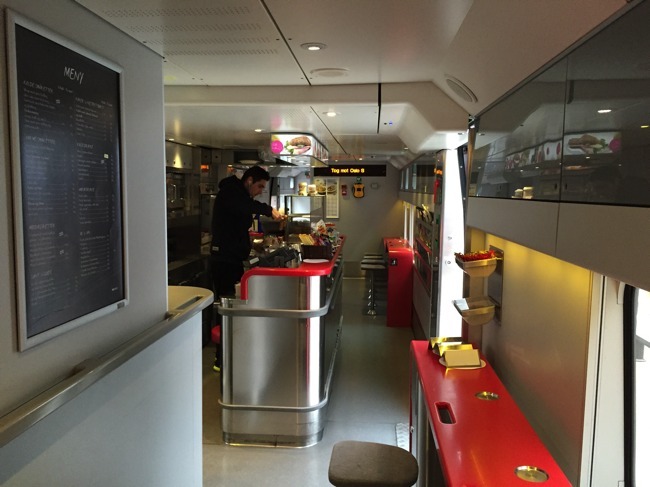 The dining car has small snacks as well as hearty meals. Stews, sandwiches, wraps and even a reindeer roast with veggies were all available on our train. Soft drinks, water, fruit juice, beer, and wine are also available. 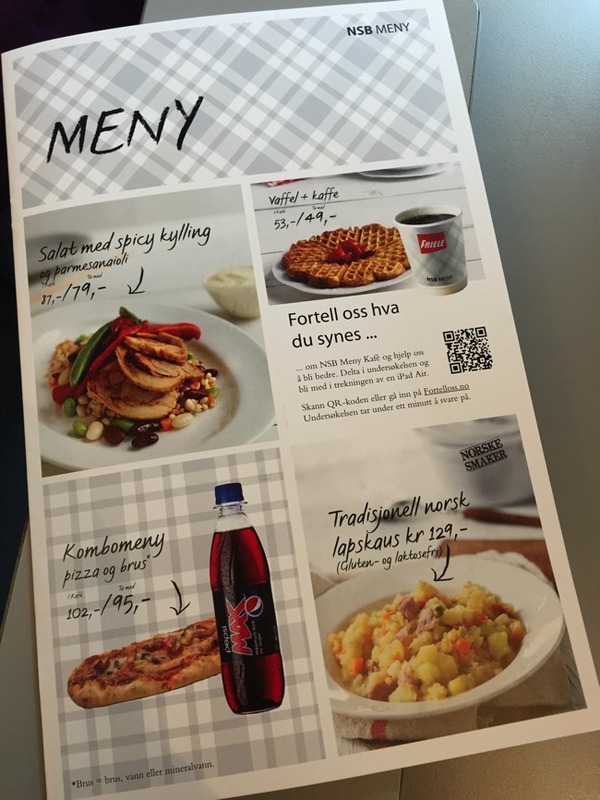 Prices are somewhat reasonable considering we found Norway to be pretty expensive. The Bergen Station is much smaller than most of the rail stations we have seen, but it provides all the necessities one needs while awaiting the train. The NSB Website has a great listing for all the train stations they service including address details and other public transportation servicing them such as public buses, trams, or even taxis. If you’re planning a visit, don’t forget to check out our Six Great Reasons To Visit Bergen Norway! This article may include links to our affiliate partners and we may get a small commission should you purchase from those links. This will be at no additional cost to you. We are an affiliate partner with Eurail train passes and could not have been happier with our choice of taking the train throughout Europe. The comfort and ease of taking the train from city to city was unbelievable! We highly recommend a train pass to see the best of Europe in luxury and comfort. One of the world's most scenic train journeys across Norway from Bergen to Oslo in just under seven hours. 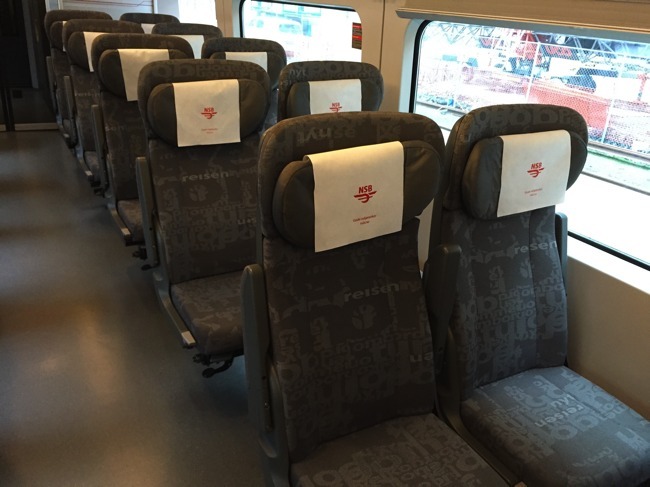 Seating options include Comfort (Komfort), Family (Familie), and NSB Standard. Many other amenities are available on this scenic rail adventure. This is a nice write up.. Just wondering, if we have Komfort ticket, can we also walk around the family area of the train? can our 3 year old boy go out there to play?